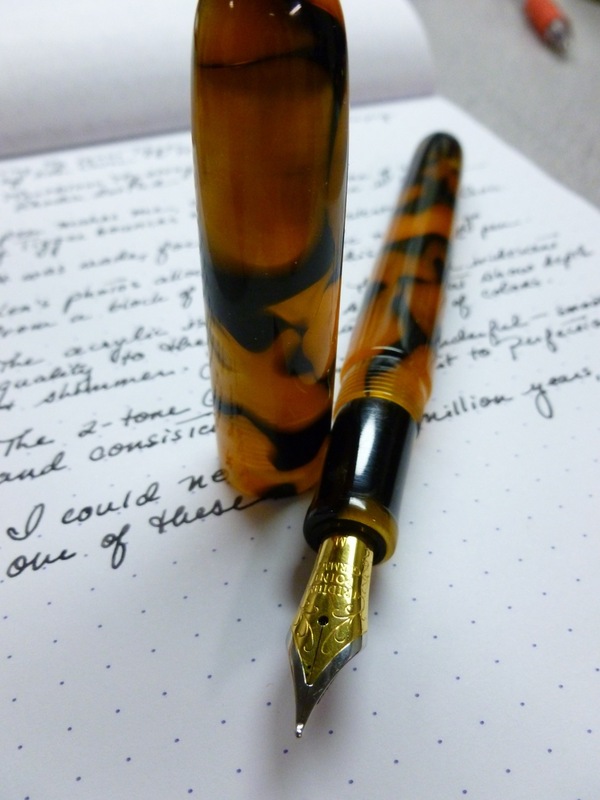 Back in the winter, I was browsing through the pens on Ken Cavers’ site and grew more and more intrigued by his Bamboo style pens. The shape is just so cool and unlike any other pen I own. And the materials? Wow. But I held off for a bit, having just come off of the Christmas spending season. THIS entry, though, did me in. We were traveling home from a Valentine’s dinner with friends, I checked my phone, read Ken’s post, and emailed him immediately. From the car. I needed a Bamboo pen, STAT. In Cumberland Ebonite, please. 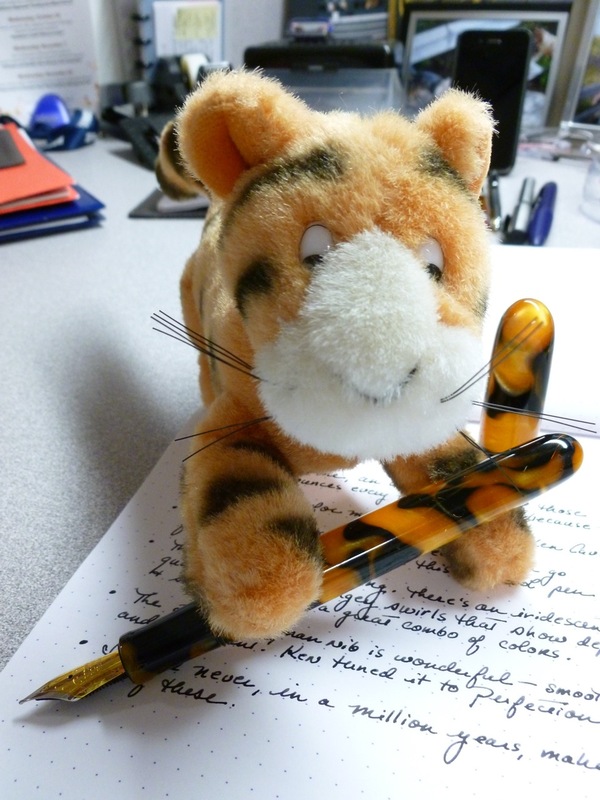 While Ken’s a talented pen-maker, he’s also a doctor, up to his eyeballs in busy-ness. And his pens have become very popular, so Ken let me know that there’d be a bit of a wait. No problem. It just felt good to be on the list. 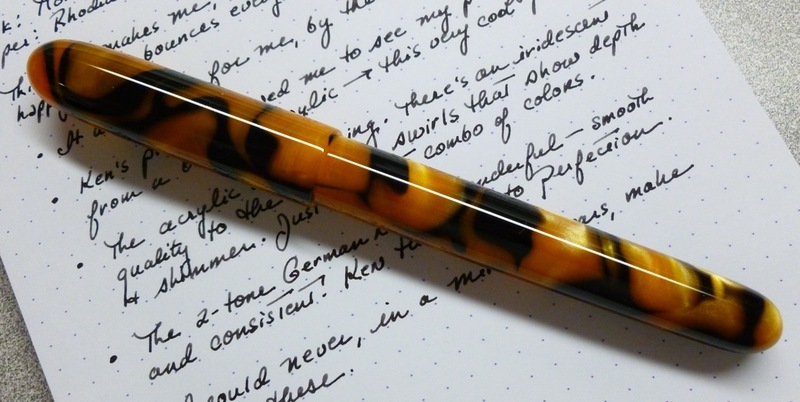 My pen arrived in late May, and was well worth the wait. 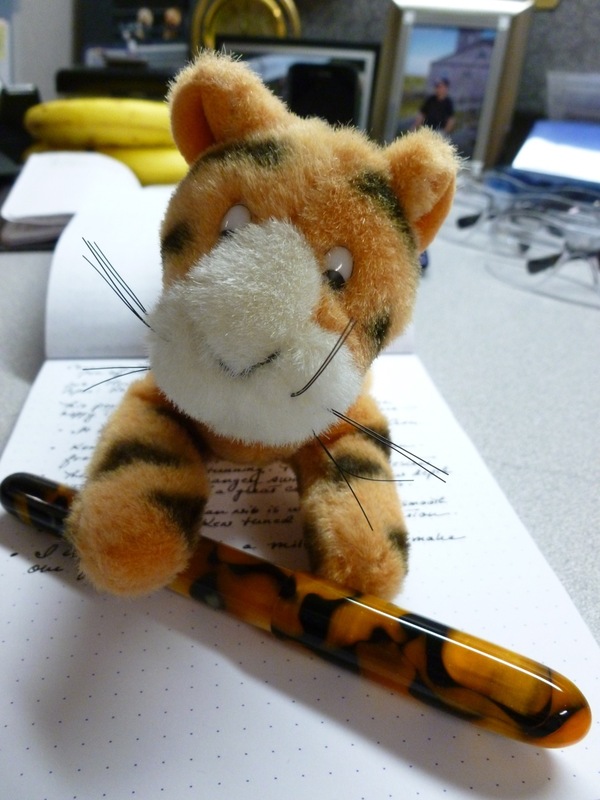 I own one of Ken’s Tiger Stripey pens, so I knew what to expect…gorgeous materials expertly crafted into a stunning pen. And that’s exactly what I received. 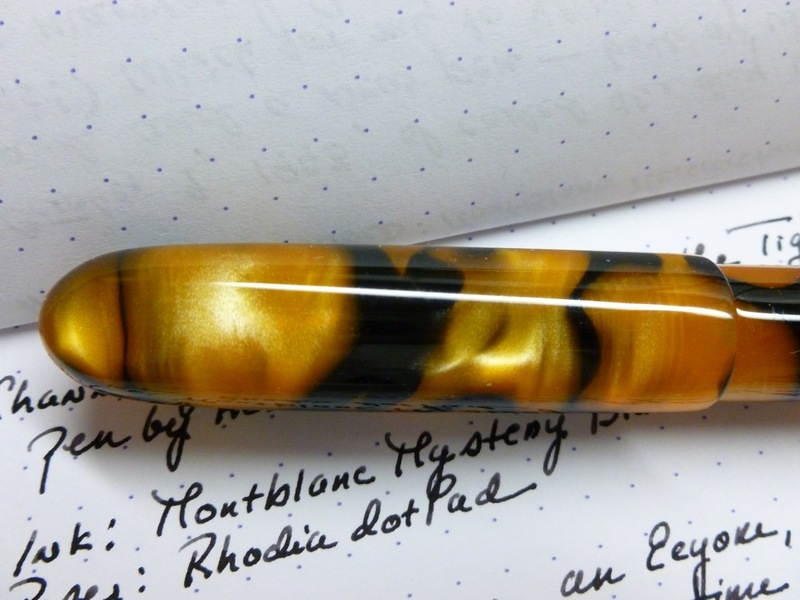 The Cumberland Ebonite smells a touch odd (a little “eggy”), but more than makes up for that in looks. There’s a bit of a wood-grain pattern that suits the bamboo shape perfectly. The black-cherry color is rich and warm and interestingly subtle. 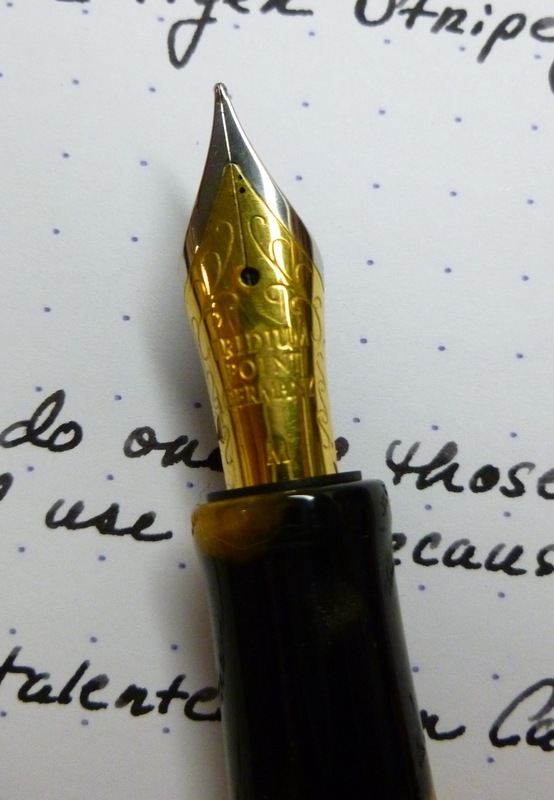 I ordered a fine nib (no surprise there), and loaded the included converter with my new favorite black ink, Monteverde’s Black. 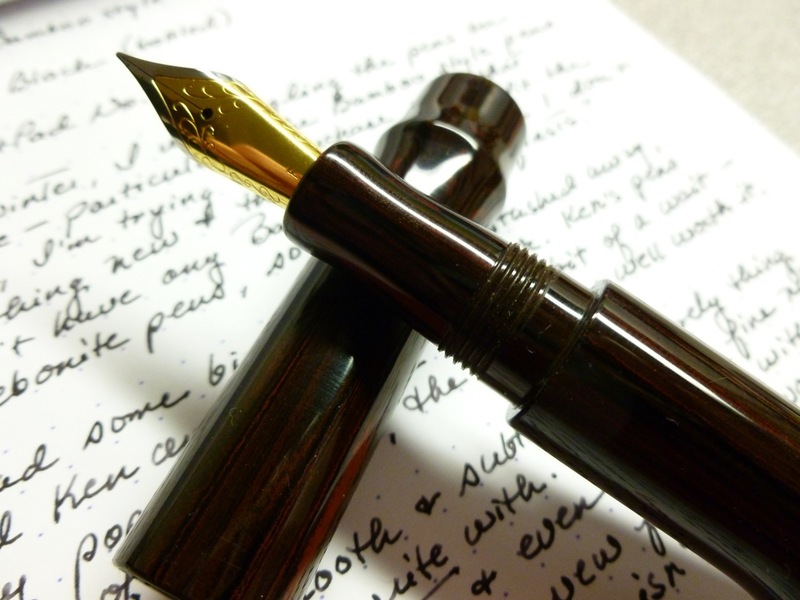 The nib lays down a line that is nicely wet and smooth; so smooth that words flow effortlessly from my head, through the pen, and onto the page. 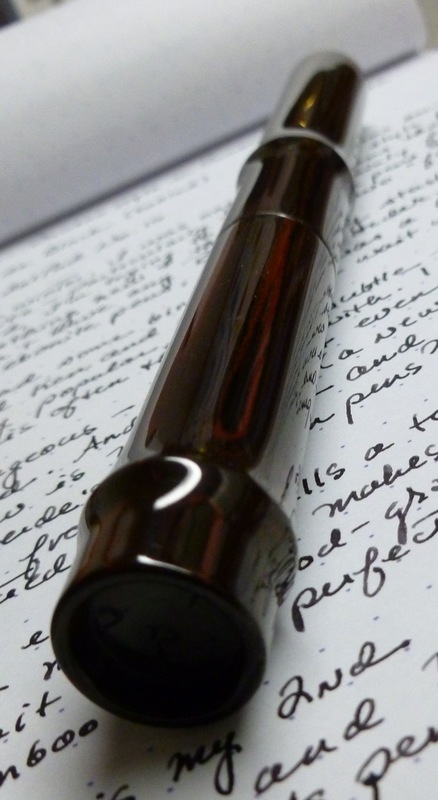 At a capped length of 6″, uncapped length of 5.5″, and a diameter of approximately 5/8″, this is a good-sized pen. The section is nicely contoured, measures about 3/8″ in diameter, and is very comfortable to hold. 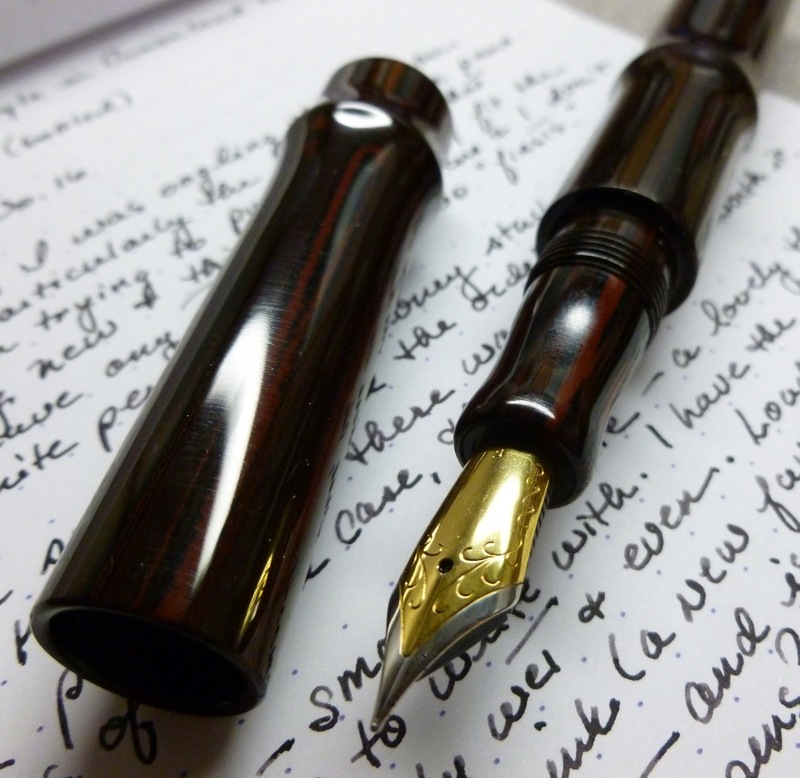 Despite its size, the pen isn’t heavy, yet feels substantial. The ebonite is warm to the touch and glassy-smooth. I like everything about the look and feel of Ken’s handiwork. So this is my second pen from Ken, but my first Bamboo style as well as my first ebonite pen. Something tells me I’ll be going back for more. I mean, check out this pocket pen. Oh, my. Dr. Ken, I’ll kill time in your waiting room any day.